The WMI Exchange Server sensor monitors the length of transport queues of a Microsoft Exchange Server 2003, 2007, 2010, or 2013 using Windows Management Instrumentation (WMI). It shows the same information as shown in Windows System Monitor ('perfmon'). See section More below for an explanation of the transport queue types. Note: Sensors using the Windows Management Instrumentation (WMI) protocol have high impact on the system performance! Try to stay below 200 WMI sensors per probe. Above this number, please consider using multiple Remote Probes for load balancing. 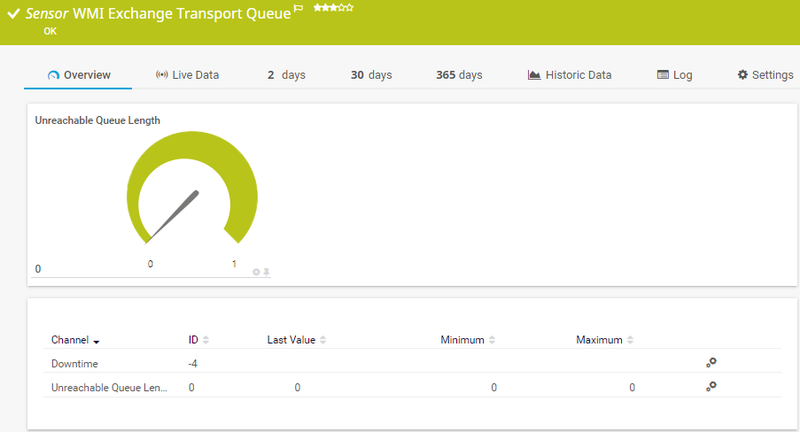 Select the transport queues you want to monitor. PRTG creates on sensor for each queue you choose in the Add Sensor dialog. The settings you choose in this dialog are valid for all of the sensors that are created. The available options depend on your Exchange server configuration. PRTG shows all possible queues with name and instance description (if available). Note: For performance reasons, we recommend to only select necessary items!